A Tenrec (Setifer setosus) in a hollow Alluaudia tree photographed in the southeastern part of the island. 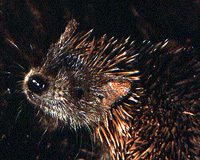 The tenrec is omnivorous and eats some vegetation, fruit, reptiles, amphibians, and small mammals in addition to its main diet of invertebrates. This insectivore probes fissures in rocks and logs with its snout and detects prey with long, sensitive whiskers.